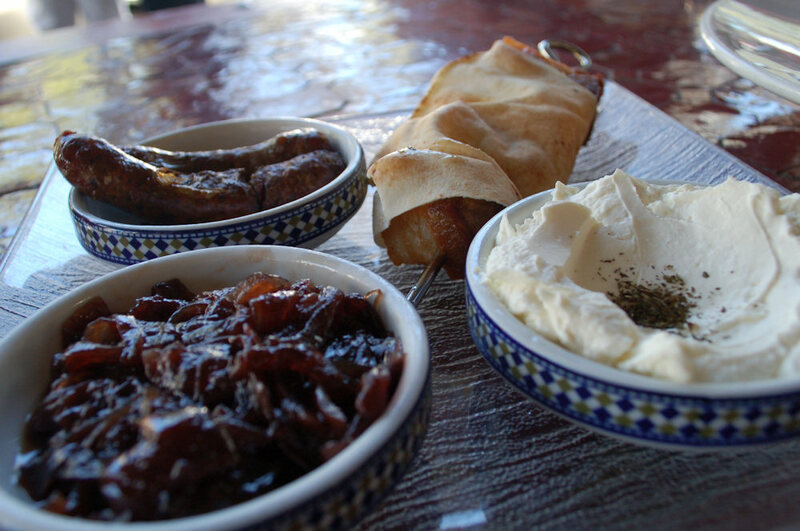 The breakfast banquet at Kazbah came highly recommended from a few friends so we had to give it a try. The venue is so popular that you’ll have to book weeks in advance for a reasonable weekend sitting. We called one week prior and managed to squeeze in a time-limited booking at 1pm. Kazbah was packed when we arrived and we had to wait 15 minutes or so for our table to become available. When we sat down the noise from other patrons was almost unbearable and we could hardly hear each other. We were happy to deal with the noise once we read the mouth watering items on the menu. 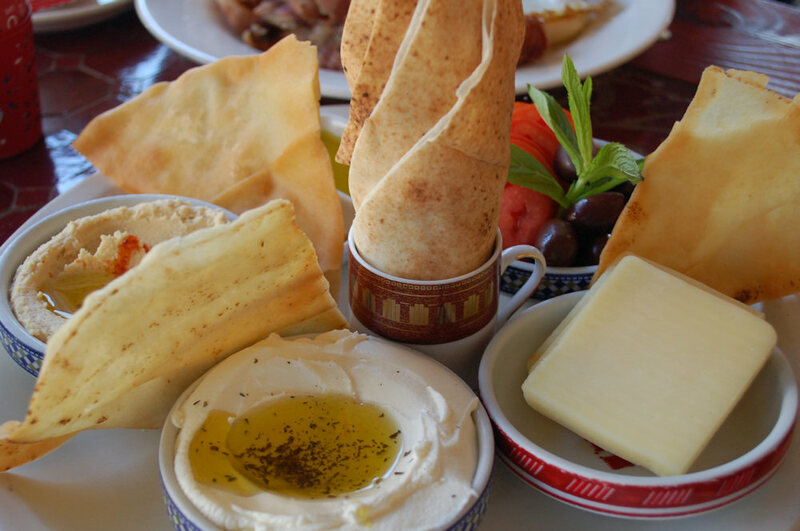 It contains a mix of Middle Eastern and North African dishes which differentiate Kazbah from many other cafés in the area. Unfortunately we only ended up with a party of 4 so alas no breakfast banquet, however the meals were still pretty impressive. 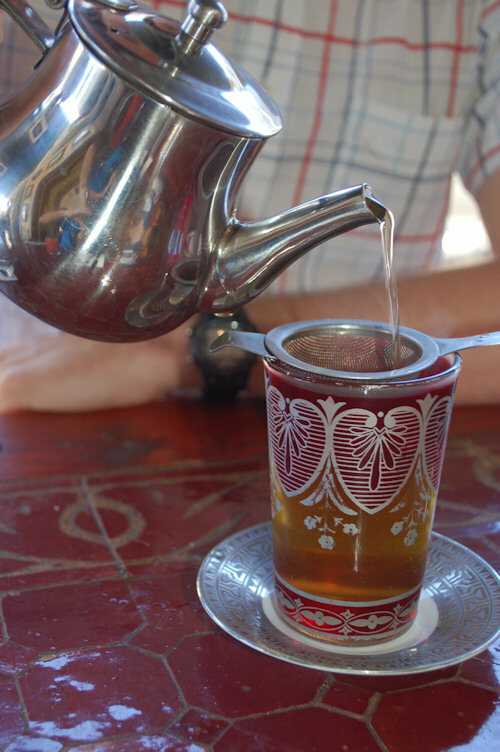 Our guest Theo tried the Moroccan mint tea ($4). Also available as are herbals: peppermint, chamomile, sencha, carcade (Egyptian Hibiscus). Our guest found the tea rather disappointing and not at all as refreshing as he’d hoped. The glass was unique and interesting. At least it was nice to look at. 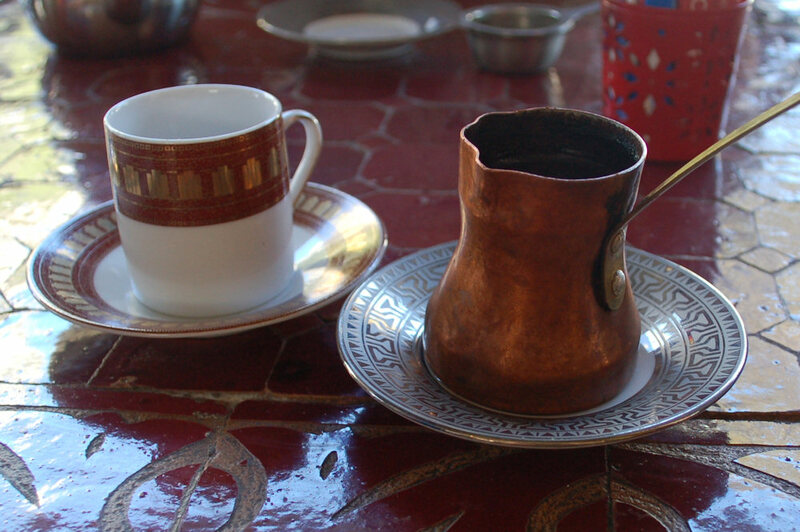 Kazbah also offers a range of the regular teas: English breakfast, Earl Grey, Darjeeling ($3.80). 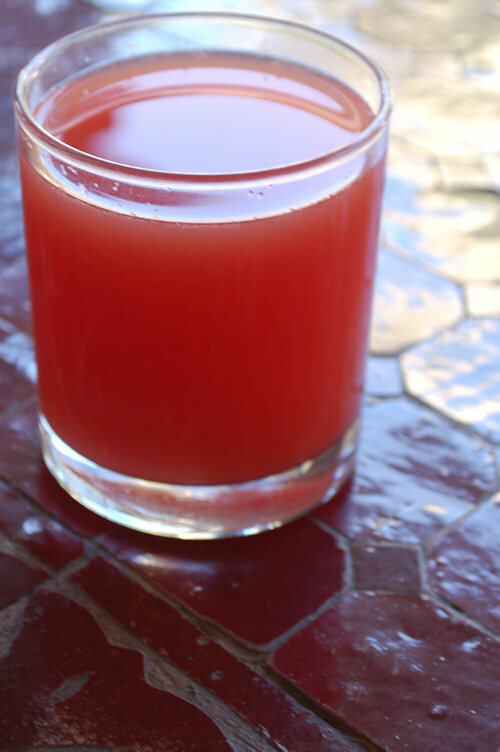 The freshly squeezed juice of the day ($6.50) was watermelon and ginger which was very strong due to too much of the latter. We didn’t find the mix to be a successful one. April tried the Turkish coffee ($4) which was so thick she had to chew it slightly. We were told that the secret is to bring it to a gentle boil 3 times before serving it. It was sweet from the sugar but also retained some bitterness from the coffee. There was no milk to be seen and it was served in the most intriguing coffee pot. Kazbah also serve the usual coffee fair for around $3.80 each. 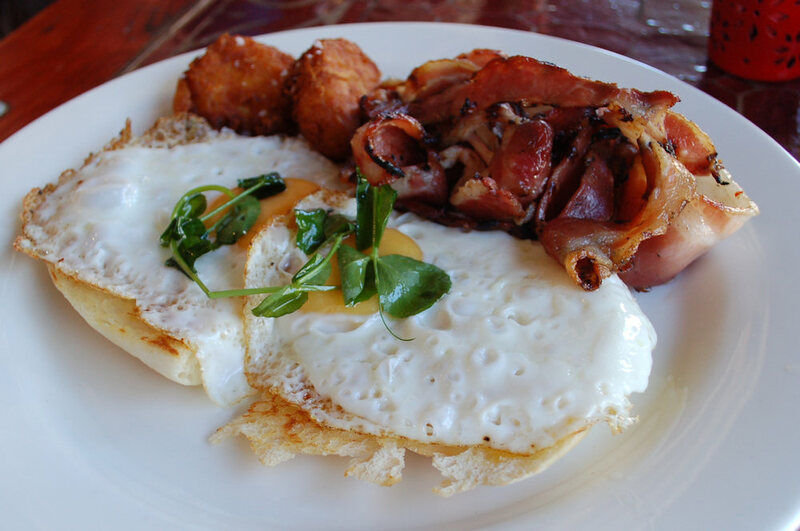 Our guest Vijay tried the well presented fried eggs with Turkish toast ($12) and bacon and potato hash ($3.90 each). The bacon and eggs were cooked perfectly and were a good serving size. The pot hash we found to be firmer and denser than we imagined but they had a delicious and crunchy casing. The breakfast Mezze ($17) hommos, labne, olives, kasseri, fresh tomato, mint, dukkah, Za’atar (mixed spices) and Lebanese bread was a dazzling sight. Presented beautifully with the Lebanese bread rolled in the centre and fresh mint and tomatoes, it was a nice change from bacon and eggs. The salty flavours are great after a big night out and the labne and hummus were smooth and fresh. We felt transported away to another time and place. 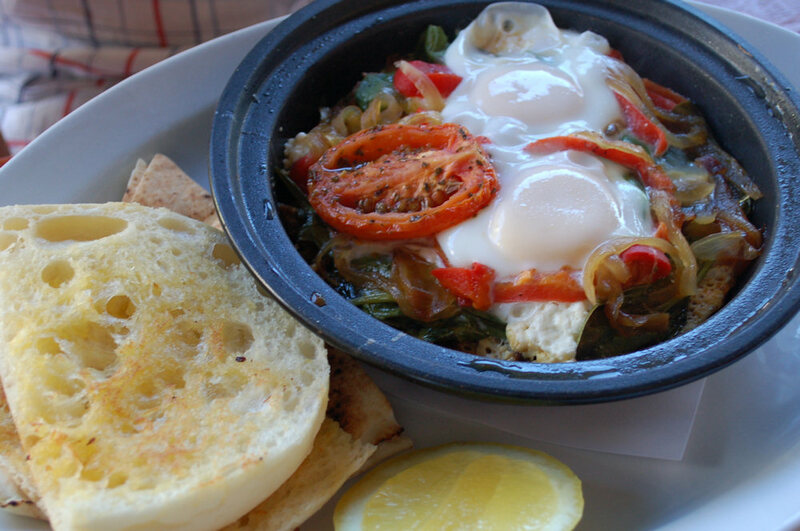 Our guest Theo tried one of two breakfast tagines ($18.50) lamb mince, sucuk, spinach, roast capsicum, roast tomato, caremalised onion, feta, eggs, Turkish toast, Lebanese bread. The best thing about Kazbah, is that they don’t just do Moroccan variations on familiar brunch themes, but fully-fledged Moroccan dishes with a hint of what you’re used to mixed in, just to reverse the entire experience and give you an entry to Moroccan cuisine that perhaps you haven’t had yet. That’s the beauty of their breakfast tajines, served in the clay bowl with the typical conical lid, which keeps the whole dish cooking in its own little private oven. The lamb mince tajine is intensely flavoursome and warming; the main ingredients (tomato, onions, red capsicum and of course lamb mince) are soaked through with gentle aromatic spices, and on top are two eggs, poached just by being cracked into the stew. It’s a neat way to switch your priorities. The lamb has absorbed so many other strong flavours that when you taste it with the eggs it works just as well as bacon, but the longer you stay with the dish, you realise it’s something else entirely. It’s exactly the kind of persistent, subtle combination of tang and tenderness that you find in all kinds of Moroccan cooking, and the eggs are only a small feature. This can be a pleasant surprise both for those who haven’t sampled Moroccan cuisine – it only gets better from here – and for those who are used to it, who may well be amazed that the tajine could be such a refreshing idea at brunch. This actually turned into a theme for the morning: the amazing abundance of new flavours that we all experienced. It’s fantastic to have such a unique establishment with so many dishes that are different to what one would normally experience. For this, we’d like to add an extra star this week. 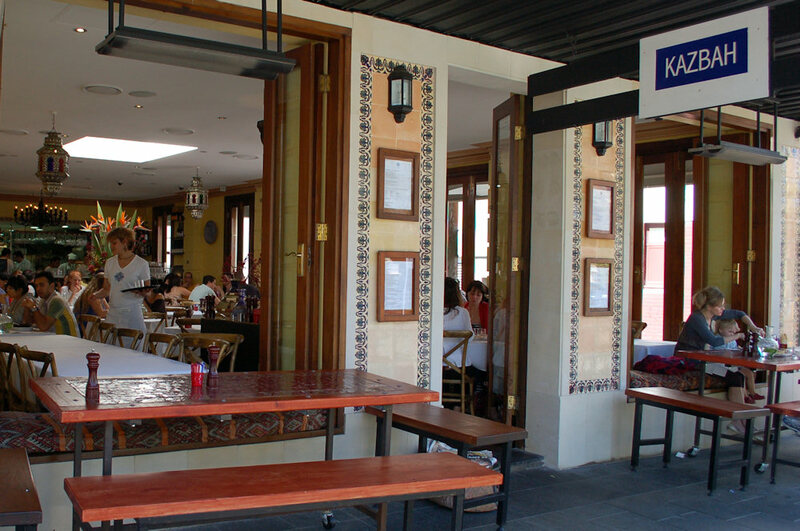 Balmain is always bustling on the weekends. Line up along Darling Street for one of Adriano Zumbo’s sweet creations or stop by the flower stall for a colourful treat. We recommend the Balmain and Rozelle markets, the latter if you’re a treasure seeker or bargain hunter. 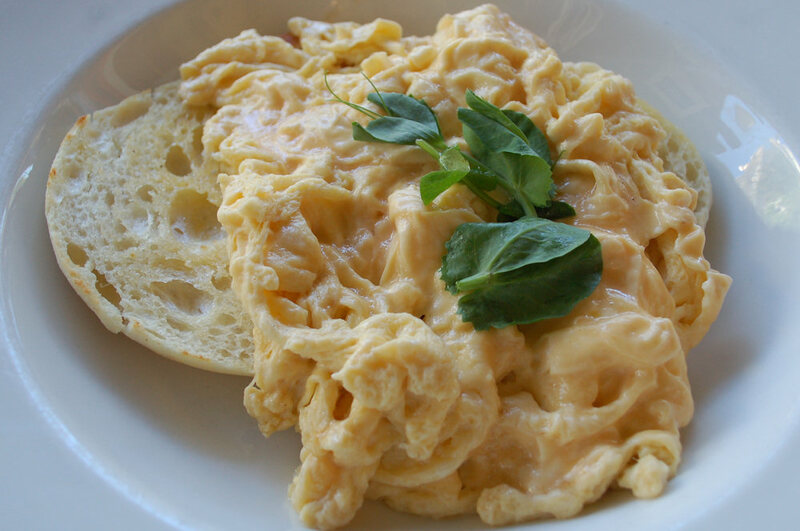 Don’t expect to have too much energy after a big breakfast at Kazbah. We recommend taking it easy for an hour or two at least. This entry was posted in Sydney - Inner West and tagged Fresh fruit and vegetable stores close by, Outdoor seating, Parking close by. Bookmark the permalink.